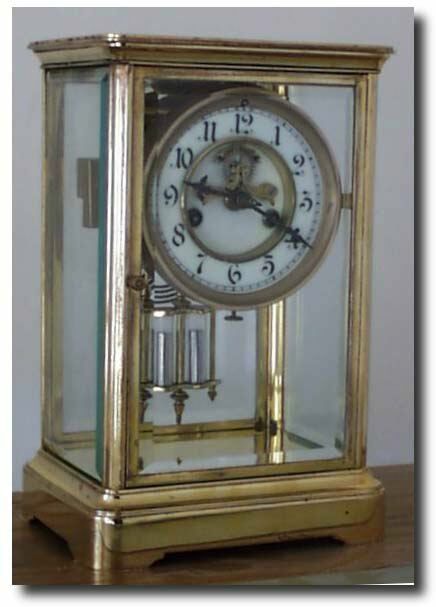 Waterbury Crystal Regulator, "TOULON" model, c. 1910 Case: Brass with "Rich Gold Plate". 10 1/2" tall. Case retains most of its original gold finish. Works: Waterbury 8 day time and strike on gong. Reference: Waterbury Clocks by Tran Duy Ly. Condition: Case: Very good. Some failures of gold plate but this is a very well cared for piece. Works: excellent, cleaned and running..